MAXIMUM CAPACITY: 14 beds, 4 beds are queen size and 10 are twins. There are also 2 couches large enough to stretch out on. You will have all 4 bedrooms at your disposal. This property was formerly rented out in 2 or 3 room configurations. For the simplicity that VRBO requires, you will receive access to all rooms. Under-promising and over-delivering are keys to a great business. With that in mind you will not be able to book your stay online. With rate specials and incentives for returning guests; I can only assure you that you are getting the right price and the best price for your group when you call. I return most calls within 30 minutes if I cannot answer right away. It is moored just 70 yards south of the Venice Marina Restaurant and Fish Board against the parking lot but yet it allows for easy access to all Mississippi River Passes and all hot spots for fishing, hunting or diving. You will find yourself in the shade on those hot days after fishing because the cleaning station is on the back deck facing north east. Our House Boat is freshly updated with 4 Bedrooms and 2 full bathrooms. Holding a total of 14 beds (some twin and some queen size) it can sleep 18 in beds and a couple more on the couches. The kitchen has 2 coffee makers, a microwave, fish fryer, 2 sets of pots and pans with matching dish-ware, glasses for the whole family and a dishwasher to help with it all. The living room has a chest freezer, washer and dryer hidden away around the corner from the surround sound, satellite TV, 65" TV and a 40" television on opposing sides of the bar. The dock has a 250 pound Commercial Ice Maker on an 800 lb ice chest, Gas Grill, Propane Seafood Boiler, Cleaning Station and Bench Seating and Folding Chairs to sit back and relax. The place is well equipped but bring your own toilet paper and paper towels to be safe. I don't stock paper products and I only stock up to 10 trash bags per guest. My housekeeper keeps the place very clean. She needs exclusive use of it on change-over days between 12 noon and 4 p.m to do so. If the cleaning ladies are done with it prior to 4 p.m. the guest will be notified of an early check-in availability. No late check-outs are allowed without a manager's approval out of respect to the housekeeper's schedule. I was introduced to Venice by friends and have been coming here from Michigan since 2011 for the world-class fishing. My father and I have been avid sportsmen our whole lives. When he told me that he was selling his business and that he would like my help to find a place on the water, I knew just where to take him. This may seem strange to some of you (especially if you haven't experienced it) but renting smaller house boats located along the main thorough fare of the marina may give you the feeling that you are still on a boat. The location of our Fishy Alibi property has less exposure to the wake put off by the other boats coming and going. I would contribute the solid feeling of it to it's sheer size as well but, whatever it is, I don't feel like I am still out on the water when I am staying in the Fishy Alibi. No more hauling the wagon back and forth! That haul takes time and energy that is better used settling in with a drink my friend. The Fishy Alibi's position against the parking lot has many other advantages as well like walking to and from the store, bar and restaurant are easy, short trips. Get your fish on the board, walk home to get what you need and back to the bar in 7 minutes. I like the number of rooms and guests have said that having 2 bathrooms alleviates a lot of issues with larger groups in the morning trying to get out fishing. Here in Venice you can fish year round, 24/7, a great place to shoot ducks, geese, rabbits, wild hogs and even deer. You can fish for bass, red fish, speckled trout, tuna, marlin, dolphin (all in the same day!) and you never know what you might see on your way out. It's common to see Manta Rays, Whale Sharks, Mola Mola, Turtle and Sperm Whales. GUESTS ARE RESPONSIBLE FOR THEIR OWN TOILET PAPER. We do not want to be responsible for accidentally mis-leading you so add it to your grocery list along with the paper towels. Both bathrooms are available to every group no matter the number of bedrooms you request keys for. It's the closest you are likely to get without sleeping on your boat. That is why Venice Marina is "Tuna Town". Aboard the Fishy Alibi, you will find all the conveniences of home. There is housekeeping available during your stay, a surround sound system and so much more to ensure a comfortable stay. Venice Marina is a true sportsman's marina. The people look out for one another like any small village. They just happen to be crazy about hunting and fishing. Very peaceful. Not only are you on the water but the dock is facing east for afternoon shade, equipped with a commercial ice maker ,800 lb. ice bin, cleaning station, propane BBQ & bench seating. The amazing location of the houseboat allows you to pull up to the front deck to move in quickly so you can wake up the next day, open your back door, and take a few short steps to your boat. I keep a back-up A/C in storage at all times. There is central A/C as well as a window A/C unit to assure that you can always keep your cool. 2 portable radiant style heaters are on the premises just in case. Yes, you will find the beds made and extra sheets on the shelves. Usually has some longer lasting condiments but I have no idea what is in there today so bring what you want and take what you find. 2 Mr. Coffees with a carafe. These take the round "basket" type filters and we usually have plenty of filters. We keep this 4 slice monster under the bar. I have no idea what we have in stock. BRING YOUR OWN PAPER TOWELS. I don't know what you will find but if you don't bring them you might wish you had. Many new utensils and kitchenware. Private Chef is available. 42" and a 65" Flat Screen located on opposite sides of the bar. Includes the SPORTS PACKAGE upgrade at no cost to you. Satellite services may go down in inclement weather. Music can be found by using the 'Guide' button on the remote control. It sounds great with the surround sound system! BluRay Player and Surround Sound system. There are several odd titles floating around including some Steven King and The Book of Beer. Tons of fishing mags. Poker chips, cribbage board and decks of cards. The southern edge of the Delta National Wildlife Refuge begins approximately where Tiger Pass meets the Mississippi River, within 5 miles of Venice Sports Marina. A Loutre State Wildlife Management Area covers an area east of the South Pass. The place was well kept, clean and comfortable. The refrigerator and cabinets were clean and cleared out for our groceries. The ice maker was great. We would use 1/2 of it each morning and it was stocked with ice for our next day when we returned from fishing on the same day. there was 7 of us, we were comfortable.the tide went out and made the front step about 3ft across the water with no walkboard but other than that it was great!! Decent camp. Get what you pay for. We had a great time at the fishy alibi. The place is dated but otherwise serves it's purpose. A/c could be better on a hot August night. Listing says internet but none at location. I make absolutely NO attempt to mislead anyone. If I did, I would expect plenty of poor ratings. Of my first 23 ratings, this is the worst rating I ever got! There must be some mistake. You stayed August 25th. It is HOT. I have 2 widow AC units to provide backup to a central AC unit. Did you turn on the window units?? The pictures of the interior clearly show it how it is. It is not modern, you are correct. It is just a clean, well maintained houseboat. Regarding the internet availability; I don't know where you got the impression that it was listed. My advertisement does not state that there IS Internet availability, but to be fair, the advertisement simply makes no mention of internet access. Perhaps it should?? Since no other complaints have been communicated, I would hope that you reconsider a higher rating... LOL... I got one text from you asking for a WiFi code during your stay but no other communication until this. Sorry I couldn't do more to get you online. Thank you for your rating my property. So that I can please more guests that follow you, please help me to understand what it was that I can improve. The boathouse was great! Park your boat on your front porch, all the ice you need, fish cleaning station, grill, fish fry pot, what else could you want? Plenty of beds and room to relax and tell tales. Will definitely be back! Thank you for your feedback. Let me know if you ever need a place to stay in the future. Cypress Cove Marina is around the corner. They offer another restaurant and bar, hotel, general store and fuel. Fort Jackson and the Fort Jackson Museum is located approximately 40 minutes up the road from Venice. It was established in 1832. It has been built by the union, used by the confederates, equipped for the Spanish American War, used for training, as a prison and even owned by an individual at one time. There is a lot of interesting and valuable history to share with you. Located along the Mississippi River it is worth the time to stop and look around. I suggest 30 minutes for the fort and 30 minutes for the museum. It is free to visitors but call ahead for hours of operation. 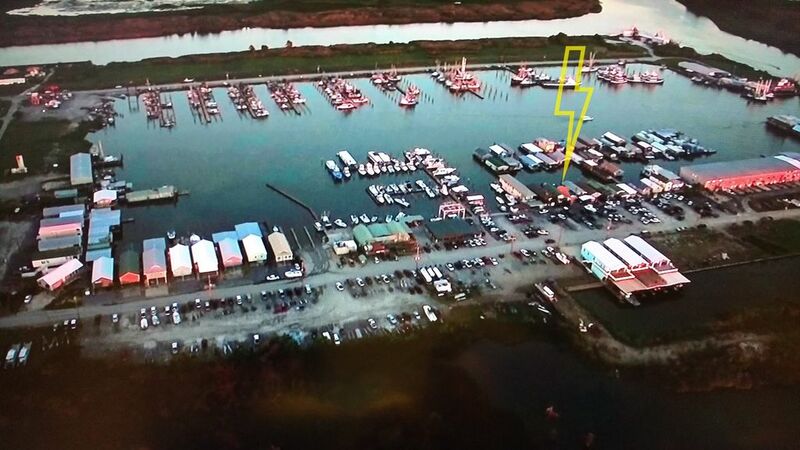 Big Game Lodge, LLC acquired the houseboat known as the Wildcat Lodge in 2014 because of it’s convenient moored location against the parking lot just 70 yards down from the fish board in the Venice Marina. The Fishy Alibi by my wife.